While there’s no major news on the Magic front today, there’s plenty brewing. 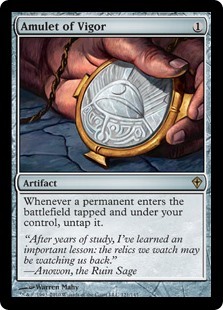 The Ravnica Allegiance spoilers wrapped up last week, and the full set will be found in players’ hands shortly. There’s plenty of tasty cardboard in this one, and I know I’m not alone in looking forward to seeing how it reshapes Standard and Modern. I’m especially excited to see Electrodominance do some work, maybe balancing out the format. The format needs balancing too, what with the way Arclight Phoenix has been going lately. Apparently something like 17% of decks at SCG Worster were Phoenix? That’s a whole lot for Modern, where non-PT numbers tend to top out at single-digit percentages. It’s not the first time we’ve seen a UR deck reach that level of play, and the last time it did, Splinter Twin paid the ultimate price. We’re only a few weeks into really understanding Modern with Arclight as a tier one strategy, so Wizards isn’t going to be in a rush to answer it with heavy hand, especially since all things considered, it’s a fair strategy. Expect some time for the format to adjust organically before action is taken. There’s been whisperings of Amulet Titan in Modern for a few weeks now, and it managed to take first this weekend, beating out piles of Phoenix decks. It’s a strategy whose popularity was hit harder than its efficacy by the Summer Bloom ban. It would seem a good foil to Arclight Phoenix, considering that we’ve been seeing an uptick in play along with the growth of Phoenix decks. While there have been various versions of the deck, and several strategies for deploying as many lands as possible, two pieces are non-negotiable, and I hope unsurprisingly, they’re the two pieces whose names make up the archetype’s title: Amulet (of Vigor) and (Primeval) Titan. Amulet of Vigor’s effect with Karoo lands is what makes the deck tick, after all. Amulet has been a worthwhile spec for awhile now, and the new attention is probably going to max this card out in a hurry. If Amulet Titan really is a strong choice for battling a Phoenix-infested metagame, players will flock to it in a hurry, especially as a tested strategy that’s already proven it has the chops to compete. When that happens, the single-printed rare is going to undergo extreme supply duress. Even though prices are already $22-$23, I don’t doubt at all that prices could climb into the $40 to $60 range, especially if it’s good without leaning on “Phoenix predator” as a feature. While we started with the Arclight foil, we’ll turn back around and hit an actual Arclight foil. Arclight is an Izzet deck looking to cast a tremendous number of cheap red and blue spells each game. It’s fast, looking to top out at four mana or so, and has an impressive array of selection. It is a perfect candidate for fastlands, as it wants to leverage them hard early, and can eschew them later when they slow down. Of course, this is only one in a long history of strong Izzet decks in Modern. There always seems to be one hanging around, and even when there isn’t one, there will be shortly. It’s a powerful color combination, and I’m expecting to see another soon with the printing of Pteramander, Delver’s amphibious cousin. And it will be a quick, spell-heavy deck looking to satisfy two mana colors early in the game. We are now more than eight years past the printing of Scars of Mirrodin, and we’ve yet to see a fastland reprint of any sort. 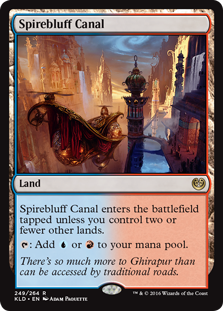 If we assume the same timeline for the Kaladesh fastlands, we wouldn’t see a reprint of Spirebluff Canal before, well, we’re all dead. Which means foils are going to be in short supply (right up until there’s no one left to buy them and it’s all rather irrelevant). There already isn’t a deep pool of these, and several more weeks of Phoenix hysteria, paired with constant pressure from other Izzet strategies that pop up in Modern, is going to empty the market soon. Foil Blackcleave Cliffs are $95, and nobody is even playing Jund today. I’d consider finding your Spirebluffs soon. Wrapping up the week we’ll look in on EDH. 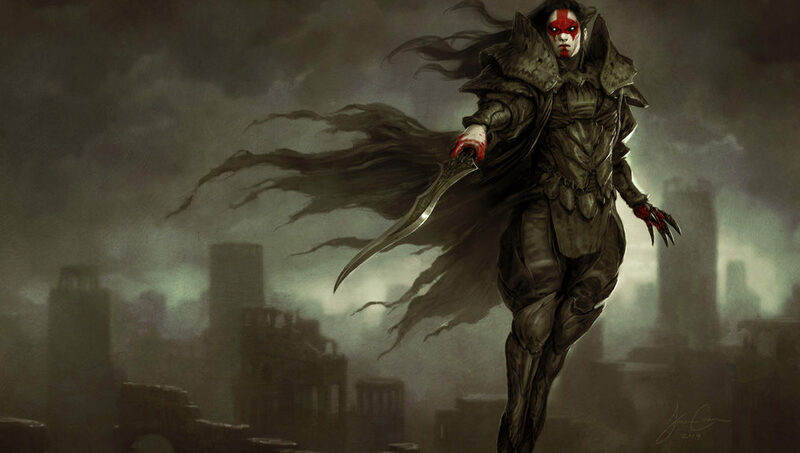 With Ravnica Allegiance around the corner we’re going to get a few new commanders, and they’ll for sure be hitting the “Top Commander” lists for a few weeks. Don’t forget too that EDH players take awhile to buy into their decks, unlike constructed players, who will shovel playsets into their cart at a moment’s notice. New commanders will easily take months to move large volumes of cards to those intending to play them, simply because on the whole, 99s aren’t built in one afternoon. Anyways, Edgar Markov has held steady on popularity for months and months now. There’s a deep pool of vampires to draw from, and sitting across three colors allows some flexibility in what you’re able to include. I’m not expecting an explosion in popularity any time soon, but he’s a consistent fan favorite. If I’m looking for specs in a tribal deck like this, I want to find cards that are excellent in the tribal build, but still playable elsewhere, in order to capture the largest demand profile. Something like Door of Destinies, a card which otherwise defies my expectations regarding pricing, is a good example. Any vampire deck is going to want to be in the Door business, and at the same time, many other strategies are too. 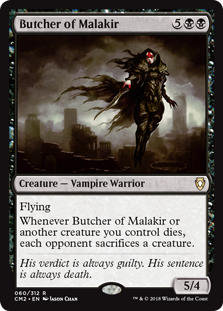 A not-Door of Destinies card in Edgar Markov lists is Butcher of Malakir. She’s a vampire, which is uh, about all the checkboxes that need to be checked for an Edgar list. She benefits from all the tribal synergy floating around, and even moreso, she provides an extremely powerful effect in her “Grave Pact on a stick” deal. Grave Pact is of course a long-standing EDH favorite. This is reflected in Butcher’s play stats – over 15,000 decks on EDHREC, to be specific. That’s the cross-deck synergy I’m talking about. An excellent choice in a popular tribal strategy, and also a great pickup for plenty of non-vampire decks.